The Breitling Huntington Beach Airshow, featuring the Breitling Jet Team and your United States Air Force Thunderbirds, will take place on October 21 – 23 on the sand of one of Southern California’s most popular beaches. The airshow promises to be an incredible experience both in the sky and on the beach! The inaugural Breitling Huntington Beach Airshow will be the only beachfront airshow on the West Coast with hundreds of thousands in expected attendance. Jaw-dropping jet stunts by the U.S. Air Force Thunderbirds and the Breitling Jet Team can be viewed on the 2-mile stretch of beach from the Huntington Beach Pier to Magnolia Street. Other Airshow performers include National Aerobatic Champion Michael Goulian, an F-18 Super Hornet TAC Demonstration, Jack Link’s Screamin’ Sasquatch, Red Bull World Champion Kirby Chambliss, Lyon Air Museum’s C-47 Dakota, esteemed aerobatic performers Bill Stein and Breitling’s David Martin. Attendees are invited to visit Aviation Blvd, the specially designated area for exhibitors, vendors and food purveyors located at Beach Blvd. and Pacific Coast Highway, to get an up close look at the latest collection of Breitling watches, Ford cars, Suzuki motorcycles and ATVS, and much more. Airshow attendees will have the chance test drive a jet in a flight simulator, see an inflatable scale model of a Boeing C-17 Globemaster III, and see a NASA exhibit on Xplanes and more. While general admission to the Breitling Huntington Beach Airshow is free of charge, two premium hospitality options are available for attendees. The Flight Line VIP experience features premium viewing, snacks and beverages for purchase, upgraded restrooms; tickets are $59. The exclusive Aviator Beach Club VIP experience is $199 and offers first-class viewing, lunch and beverages including beer and wine, and access to upgraded restrooms. Net proceeds from Airshow will go to support the Aerospace Education Foundation of Huntington Beach, a nonprofit that encourages education and careers in the aerospace and aviation fields. Parking options for the airshow include the city and state beach parking lots. Attendees are encouraged to bike or walk to the beach. There will also be a special Uber drop-off and pick up location at Beach and Pacific Coast Highway. 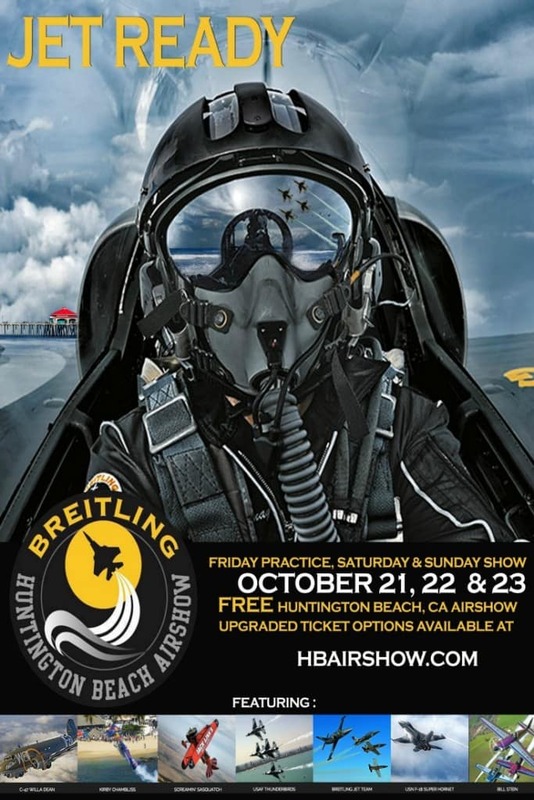 See you the Breitling Huntington Beach Airshow on October 21 – 23 from 12:00 pm – 4:00 pm!